As climate change reshapes the Earth's polar regions, scientists turn to drone-mounted cameras to measure sea ice. One expedition found out that flying drones near Antarctica isn't easy. At the ends of the Earth, climate change is altering the polar landscape and seascape faster than ever in recorded history. In the Arctic, a drastic decline in sea ice is unlocking trade routes and a new theater for the world’s navies. In Antarctica, a collapse of the western ice sheet could raise global sea levels and inundate the world’s coasts. Monitoring the state of sea ice is crucial. Satellite observations drive the numerical models and forecasts, but to verify them, scientists need in situ measurements from the freezing seas themselves—at resolutions and coverages that match the ever-improving models and the extent of satellite coverage. Imagery taken from airplanes or helicopters is one option, but these missions are very expensive and logistically challenging. Drone pilots face challenging and extreme conditions in the Antarctic. 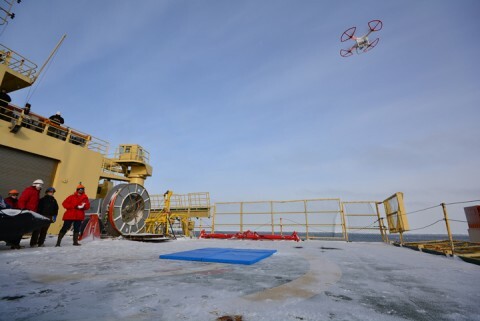 In the face of these obstacles, polar researchers are beginning to explore the use of unmanned aerial vehicles (UAVs), more commonly known as drones. As technology develops, new advanced sensors that can launch from icebreakers and survey the surrounding ice promise to provide a valuable new tool in the arsenal of seagoing scientists. Drone pilots face challenging and extreme conditions in the Antarctic: high winds, temperatures well below freezing, and landing on a moving ship, to name a few. To gather operational experience, we conducted a pilot study of drones launching from the U.S. icebreaker Nathaniel B. Palmer in April 2015 while en route to the ice shelves of East Antarctica (Figure 1). Using two off-the-shelf models of multirotor drones, we successfully captured high-resolution aerial imagery of Antarctic sea ice. We also learned about some of the drones’ limitations, and we can give recommendations for how other teams might overcome them. Sea ice is often referred to as the “canary in the coal mine” when it comes to monitoring the effects of climate change at the poles. Sea ice, a relatively thin layer (meters thick, in contrast to the kilometers-thick continental ice sheets) that forms each winter at the surface of the freezing polar oceans, is a dynamic and complex medium. It reacts to many different atmospheric and oceanic processes, making it a valuable area of study to scientists. The key area is the marginal ice zone (MIZ), where the open ocean meets the sea ice and a complex interaction between wind and waves controls seasonal advance and retreat. Arctic sea ice is declining dramatically, but paradoxically, mean Antarctic sea ice extent is increasing slightly [Maksym et al., 2012]. Antarctic sea ice is bounded on all sides by a MIZ and the Southern Ocean. In contrast, the Arctic has previously been totally covered by ice and is bounded by continents. Sea ice is very effective at damping waves, so as the Arctic ice decreases, models predict that the open water at its edges will allow more powerful waves to break up ice on the boundaries, forming MIZs, similar to processes in the Antarctic regions. Aerial observations provide valuable assistance in studying these complex environments: they provide situational awareness and spatial context for surface-based measurements from the ship and can aid ships navigating treacherous ice fields. However, helicopters cannot land on the sparse sea ice field of an MIZ, and this introduces additional safety constraints to operating helicopters over these regions. Global climate models lack information on how waves and sea ice interact. Enter drones. Scientists have long deployed autonomous submersibles to survey below the sea ice [Williams et al., 2014]. Now, aerial drones offer scientists the possibility to gain remote bird’s-eye views of the ice as well [Maslanik et al., 2002; Cassano et al., 2010]. The images they collect can be a valuable addition to existing observational data sets of sea ice from satellites, ships, and aircraft. In particular, global climate models lack information on how waves and sea ice interact. One key indicator of the annual advance and retreat of sea ice is the size distribution of the ice floes in the MIZ [Zhang et al., 2015]—we attempted to collect these data with our drone pilot study. Ready for Takeoff—But Are You Certified? UAVs are not new, and many geospatial surveying groups have developed and built their own platforms. (See “Drone Squadron to Take Earth Monitoring to New Heights” for more on scientific studies using unmanned aircraft.) However, they required significant work and pilot skill to operate. In the past couple of years, the industry has exploded with an incredible pace of development, seeing new platforms emerge on a near-monthly basis. As multirotor drones have become ubiquitous, they have become dramatically easier to fly, which allows the end user to focus more on integrating instruments and collecting data. Although the regulations surrounding these products have struggled to keep pace, they are now catching up. Most national aviation bodies now enforce strict flying rules for hobbyists and set up formal licensing for those operating UAVs for commercial gain, which in some countries includes academic research. In addition to pilot certification, specific approval for UAV operations is becoming mandatory, tailored to the operational environment and inherent risks, liability, and environmental impacts. For this study, the National Science Foundation (NSF) performed a special review of pilot competency, vehicle specifications, and operational procedures in order to permit the flights from the R/V Nathaniel B. Palmer. The unfortunate prospect of harming the pristine Antarctic environment heightens the risk involved. For now, in general, the U.S. Antarctic Program (USAP) prohibits the use of drones by program personnel without specific authorization while it develops a policy on the safe and environmentally sound use of UAVs. This model will also provide guidance for other national Antarctic programs to adopt. For this mission, the principal scientist, Guy Williams, was the pilot in command for all flights. He was trained by the TerraLuma group at the University of Tasmania, Australia, and certified in Australia by the Civil Aviation Safety Authority. He had 15 months’ experience prior to the mission and completed more than 10 hours on each platform. Our pilot program, overseen by the NSF on a voyage of the USAP, was centered on multirotor UAV operations developed by the TerraLuma UAV facility at the University of Tasmania. For testing, we chose two off-the-shelf models manufactured by DJI Ltd.: the popular Phantom 2 Vision+ quadcopter and the more advanced eight-rotor Spreading Wings S1000. Both models successfully operated in the polar environment and retrieved imagery for the determination of sea ice floe size distribution. The team scheduled UAV operations around the primary science schedule and could fly only when wind speeds were 15 knots or less with plenty of daylight. As such, we completed nine flights on three separate occasions. Fig. 2. (top) Aerial image of pancake field, taken by the S1000 UAV on 9 April (day 2). 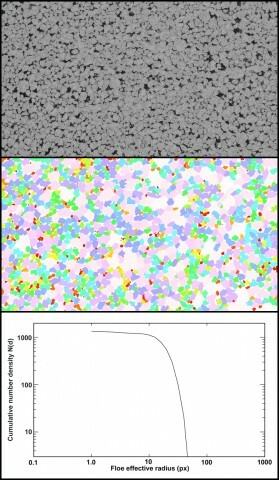 (middle) Floe segmentation based on mathematical morphology for the aerial image (following Paget et al. ). (bottom) Probability distribution function of floe size distribution. Click image for larger version. On day 1, the ship was idle but drifting with the winds and currents. We performed basic hover testing over the ship’s helideck to introduce the crew to the operational protocols. This introduction included going over emergency responses to drones crashing into the ship or personnel or going over the side and needing recovery. Both types of UAV were launched in attitude mode (ATTI), in which the drone automatically maintains orientation but not position. In general, the drones were unable to operate in GPS mode, where the drone automatically maintains both orientation and position. The inability to use GPS mode is a known issue that previous teams working with multirotor UAVs in polar regions have reported. The problem is the poor performance of the drone’s magnetometer close to the magnetic poles, which combines with its GPS to provide attitude and position. On day 2, four flights were undertaken with the S1000s flying astern of the ship. Again, they couldn’t achieve a GPS hold, and this prevented autonomous waypoint navigation for structured aerial mapping. There was also some erratic behavior (the cause was never fully resolved) during manual piloting of the S1000s and the Zenmuse Z15 gimbal system that provided pivoting support to a Panasonic Lumix GH4 camera (with an Olympus M.Zuiko 12mm f/2.0 Micro Four Thirds Lens) mounted to it. Winds were also stronger and gusting over 20 knots, which increased the challenge of flying and landing in ATTI mode. Nonetheless, the drone was able to acquire aerial imagery (16.1 megapixels), facing both down (Figure 2) and toward the horizon. Day 3 flights were in the early evening: we had our first successful operation of the Phantom 2 in GPS mode, allowing it to carry out a preprogrammed flight plan, gathering images (14 megapixels) and 1080p video (HDTV high definition) around the ship at flying heights greater than 100 meters for more than 12 minutes (Figure 3). Fig. 3. 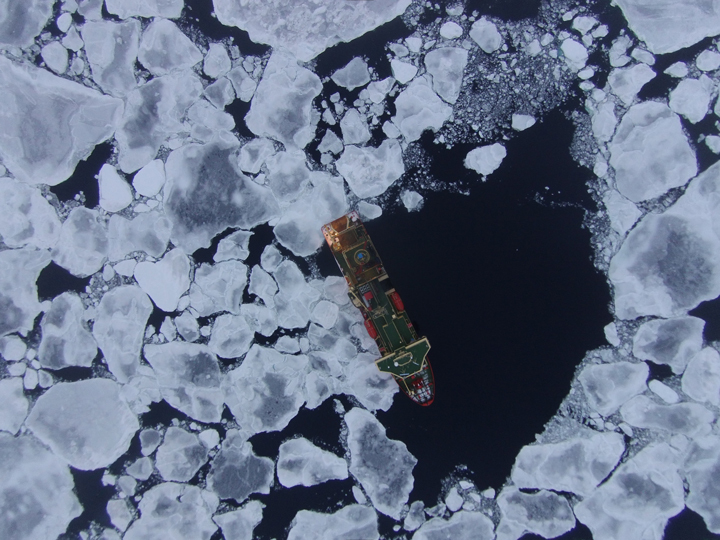 The Phantom 2 Vision+ UAV took this image of the U.S. icebreaker Nathaniel B. Palmer on 13 April 2015 (day 3) during an assessment of floe size distribution conducted en route to the ice shelves near East Antarctica. The final flight with the S1000 did not achieve GPS hold, and the gimbal was no longer oriented correctly when it was in ATTI mode. After we returned home, we resolved this using a firmware upgrade to the Zenmuse Z15 gimbal that had become available during the voyage to address a specific balance issue affecting the A2 controller in ATTI mode. Sea ice image analysis is often completed in gray scale, given the lack of color in detecting white sea ice on a dark ocean. Sea ice researchers joke that their line of work involves “256 shades of gray.” Nevertheless, these shades of gray provide a wealth of valuable information. Both the S1000 and the Phantom 2 proved capable of taking basic aerial imagery suitable for determining floe size distribution (Figure 2), with a basic correction using PTLens applied to the latter to remove the pin-barrel distortion of its mounted GoPro camera. The Phantom internally geotagged the images, and we used an external GPS logger for the images collected by the S1000. In both cases, the geotagged images will allow us to perform future analysis and create mosaics. Optimized mapping surveys over large continuous floes promise to return much greater detail in the surface morphology. Ultimately, more sophisticated flight patterns are required for sufficient image overlap, either in autonomous or manual modes, to exploit this photogrammetry further. There may be a limit to what can be achieved in the dynamic sea ice field of the MIZ, as waves jostle the position of small floes between images. However, optimized mapping surveys over large continuous floes sampled during “ice station”–type voyages, where the ship moors against the floes and scientists can leave the ship to conduct experiments on the ice itself, promise to return much greater detail in the surface morphology. Natural extensions of this work include lidar laser scanning systems to map the three-dimensional structure and hyperspectral imaging to measure biological productivity [Wallace et al., 2012; Lucieer et al., 2014; Turner et al., 2014]. However, these instruments are heavier and pricier—and therefore riskier. Deploying drones and underwater vehicles in concert to take simultaneous measurements from above and below sea ice may become feasible in the near future, presenting another exciting prospect. This pilot study successfully proved the concept of rapid deployment of multirotor UAVs for aerial sea ice imaging. The operations were conducted safely, with greatly reduced risk and cost compared to helicopter operations, and did not interfere with the primary scientific objectives of the voyage. The purchase price of an off-the-shelf drone is only a quarter of the total expense. The final project cost for a research voyage also includes spares, cases, training, and certification. Current consumer-grade multirotor UAVs are best suited to gaining a quick bird’s-eye view of the ship and surrounding ice. True aerial mapping with multirotor drones will require more sophisticated models with better performance. An alternative is to use fixed-wing drone airplanes, but that brings the added challenge of landing and retrieving them on the ship. Pilot experience, certification, and operational background are critical to handle the challenge of polar operations. Pilots must also have extensive training in maintenance (modifications, sensor distribution, firmware updates). In particular, pilots must be trained in ATTI mode in 15- to 20-knot wind speeds and limited-area takeoffs and landings. Nonetheless, what was impossible several years ago is now possible, and this theme will continue as unmanned aerial platforms develop in response to the urgent need for expanded in situ observations of sea ice. In late 2015, we completed UAV operations over the Arctic MIZ in the Beaufort Sea from the R/V Sikuliaq. Using the DJI Phantom 3 Advanced UAV, the team achieved 5 hours of flights with GPS hold, attaining a maximum range and altitude of 500 meters (see video below). Initial calibration on the ice, away from the ship, proved helpful. We also deployed a fixed-wing UAV, which used a 3DR Pixhawk autopilot and successfully operated autonomously to produce a photo mosaic of the sea ice field at each ice station while an autonomous underwater vehicle surveyed the sea ice from below. We were able to use a net effectively to recover the fixed-wing UAV when we needed to take off and land back on the ship. This project was funded by the Australian Research Council and supported by the Australian Cooperative Research Centre program and by Grant-in-Aids for Scientific Research 25·03748 of the Ministry of Education, Culture, Sports, Science and Technology in Japan. Research voyage NBP15-03 was conducted on board the R/V Nathaniel B. Palmer and supported by the U.S. Antarctic Program (USAP). Antarctic UAV operations were overseen and planned in coordination between the U.S. National Science Foundation and USAP. Cassano, J. J., J. A. Maslanik, C. J. Zappa, A. L. Gordon, R. I. Cullather, and S. L. Knuth (2010), Observations of Antarctic polynya with unmanned aircraft systems, Eos Trans. AGU, 91(28), 245–246, doi:10.1029/2010EO280001. Lucieer, A., Z. Malenovsky, T. Veness, and L. Wallace (2014), HyperUAS—Imaging spectroscopy from a multi-rotor unmanned aircraft system, J. Field Rob., 31(4), 571–590, doi:10.1002/rob.21508. Maksym, T., S. E. Stammerjohn, S. Ackley, and R. Massom (2012), Antarctic sea ice—A polar opposite?, Oceanography, 25(3), 140–151, doi:10.5670/oceanog.2012.88. Maslanik, J., J. Curry, S. Drobot, and G. Holland (2002), Observations of sea ice using a low-cost unpiloted aerial vehicle, in Ice in the Environment: Proceedings of the 16th IAHR International Symposium on Ice, vol. 3, pp. 201–206, Dep. of Phys., Univ. of Otago, Dunedin, New Zealand. Paget, M. J., A. P. Worby, and K. J. Michael (2001), Determining the floe-size distribution of East Antarctic sea ice from digital aerial photographs, Ann. Glaciol., 33, 94–100. Turner, D., A. Lucieer, Z. Malenovsky, D. King, and S. Robinson (2014), Spatial co-registration of ultra-high resolution visible, multispectral and thermal images acquired with micro-UAV over Antarctic moss beds, Remote Sens., 6(5), 4003–4024, doi:10.3390/rs6054003. Wallace, L., A. Lucieer, C. Watson, and D. Turner (2012), Development of a UAV-lidar system with application to forest inventory, Remote Sens., 4(6), 1519–1543, doi:10.3390/rs4061519. Williams, G., T. Maksym, J. Wilkinson, C. Kunz, P. Kimball, C. Murphy, and H. Singh (2014), Thick and deformed Antarctic sea ice mapped with autonomous underwater vehicles, Nat. Geosci., 8, 61–67, doi:10.1038/NGEO2299. Zhang, J., M. Schweiger, M. Steele, and H. Stern (2015), Sea ice floe size distribution in the marginal ice zone: Theory and numerical experiments, J. Geophys. Res. Oceans, 120(5), 3484–3498, doi:10.1002/2015JC010770. Citation: Williams, G. D., et al. (2016), Drones in a cold climate, Eos, 97, doi:10.1029/2016EO043673. Published on 19 January 2016. What Do People Drink When They Think Their Tap Water Isn’t Safe?